Among the many unforeseen situations Emmett encounters in Nevada is forbidden love when he falls for Li Xu, the fascinating daughter of Chinese immigrants. But before the relationship has time to bloom, Li Xu disappears--kidnapped along with five other young women. I don't read many westerns. It's not that I don't like them, it's just that I find it hard to find my type of western. And if you ask me what that is, I'd struggle to tell you....hmmm.. that's probably why I don't read many westerns. 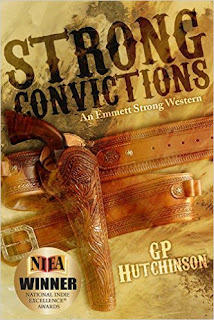 Anyway, after not reading one for a year or so, I was in the mood to read about a good ol' fashioned gunslinger, and after trawling Amazon for days looking for the right book, I finally found it - Strong Convictions: An Emmett Strong Western. The book opens up with Emmett Strong losing his wife, not by anyone else's hand, but more tragically by his own. And that opening chapter almost instantly drew me in and left me wanting more. Then after a few years later, Emmet, now a Texas Ranger, loses another loved one, this time it's his brother. The story then follows Emmett, as he tracks down his brother's killer, along with the aid of his brother-in-law, Juanito, and an Englishman called Sikes. I have to say, I really enjoyed this book and it was quite an informative read for me to see how the wild west was in 1876. The author touches upon the treatment of women, races, and slavery. You get a real sense of how harsh it was during those times. GP Hutchinson paints a broad picture in vivid words when he describes the surroundings from Texas to California. I could close my eyes and imagine myself riding through one of those dusty, western towns. I thought the charters were well written and Emmet, is a strong, stoic gunslinger, but is suffering from the tragedy of shooting his wife, and you get to see indecision and self-doubt plague him, which I thought was good, as it showed he wasn't invulnerable. There is romance in this novel, which truthfully I thought was a bit superficial, and didn't seem believable to me, but I'm glad it wasn't the eye-rolling sappiness you often come across nowadays. This is a very well written western that paints an alluring picture of 1876 California. I'd recommend this book to those who wish to escape to a different time and place, with a hero you can root for and villains you can jeer at.